If you’re at a loss for what to get your sweetheart this Valentine’s Day, don’t worry. Just drive over to your local Target or other big-box all-purpose store or pharmacy and check out their special seasonal section, which is full of tons of great candy choices. Whether you prefer your candy romantic, sweet, silly, or weird, you should find a great selection at discount store prices. Check out what I found. Iâ€™ll be honest with yâ€™all â€“ when I think of high-end chocolate, Russell Stover isnâ€™t exactly the first brand that springs to mind. Itâ€™s grouped in my mind with companies like Palmer and Allen as lower-end chocolate companies that probably arenâ€™t doing much worthy of a serious Candy Addictâ€™s notice. But then I started to read reviews of their chocolate-covered Easter egg lineup â€“ really good reviews. So, this post-Easter sale season, I decided to pick up a couple to review. 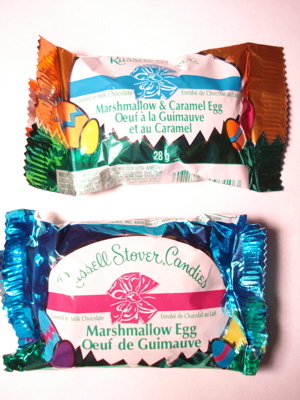 Although the eggs are available in several varieties, including the ever-popular caramel egg, being the mallow junkie that I am, I went for the marshmallow and marshmallow caramel varieties. 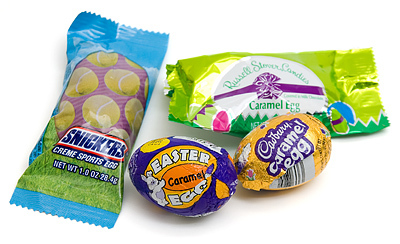 For me, one of the best things about Easter candy is the plethora of interesting chocolate Easter egg flavors. For some reason, this year I kept seeing caramel eggs everywhere. It’s like the Easter Bunny was laying them in my path in every store I visited. Being a Candy Addict, I couldn’t just ignore that kind of taunting and finally bought a bunch of different kinds to try. Every Easter I get kind of dazed by the sheer multitude of chocolate Easter bunnies beckoning to me from the store shelves. They’re all pretty and shiny, and I can hear them calling, “Pick me! Pick me!” But which one to choose? Well, this year I embarked on the Bite A Bunny experiment. I did a taste test to decide, once and for all, what the best bunny choices are. 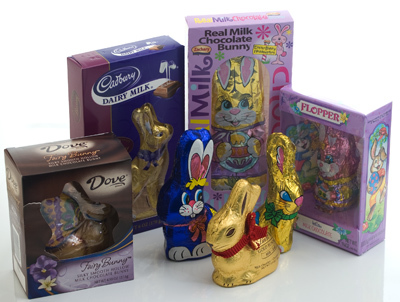 So I didn’t get totally overwhelmed by the bountiful bunnies, I had some simple rules: stick to milk chocolate, go for hollow bunnies where possible, and only choose bunnies that are readily available to the average shopper. I came up with seven contestants. All bunnies were hollow, except where noted. I normally don’t eat Russell Stover brand chocolate, and usually skip to something by Hershey or Reese’s. The fact that this product contained such an enticing ingredient as “Raspberry Whip”, was enough for me to forego my usual Snickers. I picked this up while on the way home from a movie convention (yes, I have interests outside of candy) and after walking around all day without eating, and facing an hour drive home, I stopped at a Walgreen’s on the way home to get a drink and saw these. The raspberry is absolutely delicious. Raspberry and chocolate are probably my favorite candy combination and the raspberry whip was excellent, soft, very flavorful, and almost melts on your tongue. 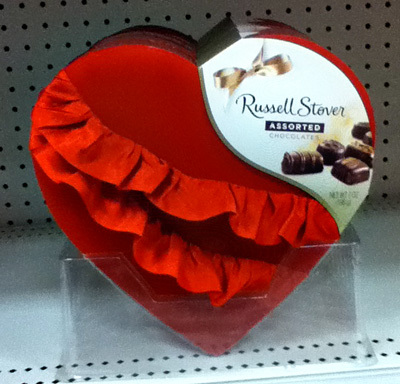 The chocolate on the other hand, was nothing special, as seems to always be the case with Russell Stover chocolate. It also seems to end up with these tiny, hard portions, that almost ruin the entire candy. 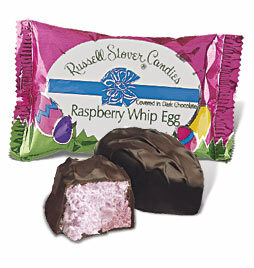 My advice to you: buy these eggs, open them up, and eat the raspberry whip with a spoon, but discard the chocolate shell – you’ll enjoy it more that way.